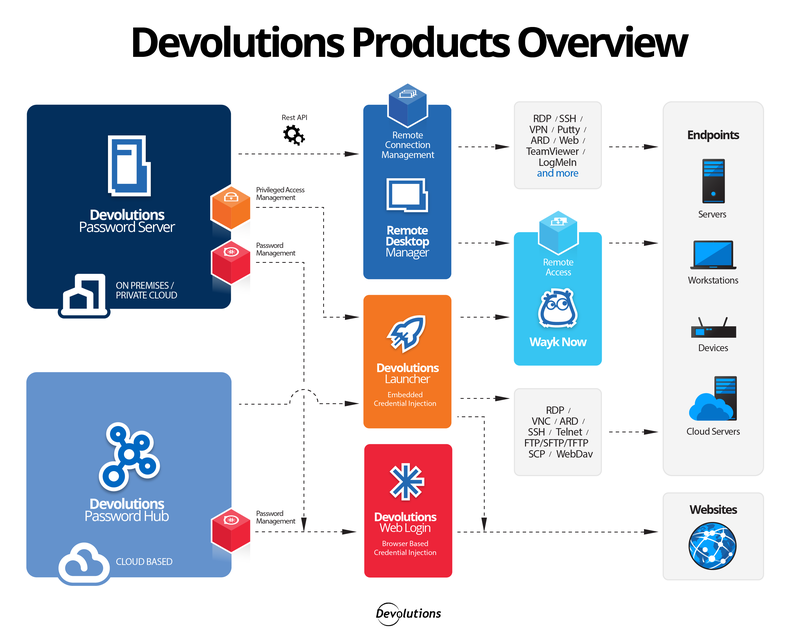 It’s the start of a new year here at Devolutions, which means that it’s my privilege to share our 2019 Road Map, which highlights the goals we have planned for the year ahead. Before getting started, I’d like to take a moment and thank all of our users for being such a critically important part of our world. Since launching more than a decade ago, we have been committed to listening to our amazing community — not just when you tell us what you like, but also when you tell us what we should improve or fix. We do not exist to serve ourselves: we exist to serve YOU, and to help you control the IT chaos in your organization. So once again, on behalf of everyone here at Devolutions, thank you for making us part of your organization’s security, governance and productivity solution. Now, please join me as we look ahead at some of the big milestones we have planned for this year. Remote Desktop Manager has come a long, long way since 2011. Today, it is relied on by more than 400,000 users in over 140 countries. Even though we have added other flagship products to our roster, Remote Desktop Manager will always have a special place in our heart. It’s the product that started it all, and we wouldn’t be here without it! By the way: as you might have noticed, we have decided to switch our product versions from numbers to years. The biggest reason for this is to make things clearer for those of you who use legacy versions. Please stay tuned as Joey will be posting an article about this soon. Initially, Devolutions Password Server was primarily designed as a password management tool. However, over the years it has developed into a much more powerful enterprise-grade solution for controlling access to privileged accounts and managing remote sessions (while still allowing you to manage your credentials). As Max shared last month, Devolutions was listed in Gartner’s first-ever 2018 Magic Quadrant for Privileged Access Management for its PAM solution, Devolutions Password Server and Remote Desktop Manager. Devolutions Password Server 2019.1 will be all about improving your Devolutions Password Server experience. That’s why version 2019.1 will feature more than 100 improvements and bug fixes, as well as some minor new features such as a new diagnostic report. Devolutions Web Login is a browser extension that lets you inject Remote Desktop Manager or Devolutions Password Server credentials directly into a browser. Wayk Now is our flexible, lightweight and secure remote desktop and remote support solution. Since launching Wayk Now in late 2016, we have implemented several major changes — including two of the biggest: we made it free for both personal and commercial use, and we added unattended access. And on a less technical but enjoyable note, we added Waykee to our team – Wayk Now’s cute plush mascot who goes on fun global adventures. Wayk Den is a cloud service that supports peer-to-peer connectivity over the Internet, so that you can access a remote computer outside of your network. Towards the end of the year, we will be launching the on-premise version of Wayk Den. While the cloud version of Wayk Den is highly secure, we understand that some users need or want an on-premise solution. While Devolutions Password Server can be deployed on premise and is focused on managing access to privileged accounts, Devolutions Password Hub is an easy-to-use, ultra-secure, cloud-based password manager that can be used by a single user or an entire organization. It also integrates with Devolutions Web Login (desktop browser or the upcoming mobile app). We have a very good track record of achieving 100% of annual Road Map milestones, and I’m confident that our great team will get everything done in 2019 — plus some additional developments and updates. We will also be hiring smart and creative new team members. As the old saying goes, the more the merrier! Yet again, on behalf of everyone at Devolutions, I’d like to thank all of you for your loyalty, support and feedback. We work hard to keep earning your trust, and we look forward to helping you control the IT chaos in your organization in 2019 and beyond. Stay tuned!